Among the many fun things we did while Paula was here, my favorite was the day I almost declined to join P & A since I was feeling like I needed to tackle some studying. 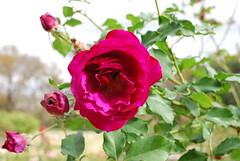 On Saturday, we went to the Zilker Botanical Garden and just strolled through the rolling landscape. The sections were diverse and included things like a little Swedish pioneer village, a spectacular rose garden, a lush prehistoric garden, a butterfly trail, a bamboo trail, and my favorite, the Japanese garden. 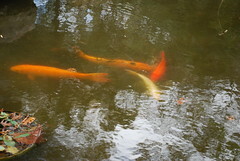 The huge koi were putting on quite a show, jumping and splashing to the delight of squealing children (some were scared and one boy told his parents that someone had painted the fish). 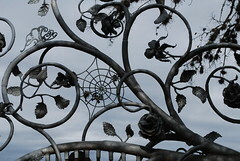 This is a detailed shot of a huge, iron gate at the end of the garden. I thought it was so cool. 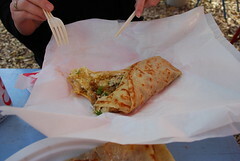 After working up an appetite at the Botanical garden, we headed to Flip Happy Crepes. Out of a kitschy, old-school camper, gourmet crepes are made. It was the perfect fall day to sit outside while a shower of leaves came down on us every time there was a breeze (I'm still finding leaves in my purse). 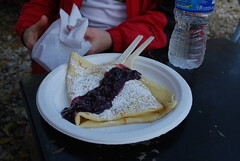 Paula had the lemon crepe with blueberry sauce. 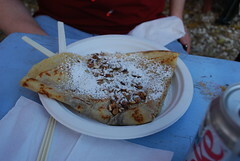 Austin had the cinnamon sugar crepe with toasted coconut and cream cheese frosting. I, as always, chose the savory option, a three cheese (gruyere, goat cheese, white cheddar) crepe with caramelized onions and spinach. It was a fantastic day; we love having visitors so we have more of reason to explore Aus-town. Sounds like a great time. Sigh, just like we did, the garden and the Food Network fabulous crepes. I must make a clarification about the trailer- it was a silver Airstream trailer, was it not? The quintessential in retro-trendy trailers. There's even a doc. on Airstream trailers- they have quite a place in history. Nick and Carrie's Excellent Adventure!